The living room is one of the most frequently redesigned spaces in the house, as different types of furniture go in and out of style, things like wallpaper become obsolete, and interior decorating trends come and go with the latest fads. Because of this, it can sometimes seem impossible to keep our living spaces up-to-date, especially for those of us who love to binge-watch HGTV shows and are constantly scrolling Pinterest for interior design inspiration. At Rinehart Design Group, our team of interior designers can help bring your dream home to life with modern home decor, cozy furniture, fresh interior paint colors, stunning custom cabinetry, and so much more. Contact us today to learn more about our interior design services for homeowners in Chicago, Atlanta, Florida, North Carolina, and beyond, and continue reading for some interior design tips to follow when it comes time for a living room remodel! Often, homeowners are hesitant about starting living room renovations and remodeling projects because there are so many decisions to make. 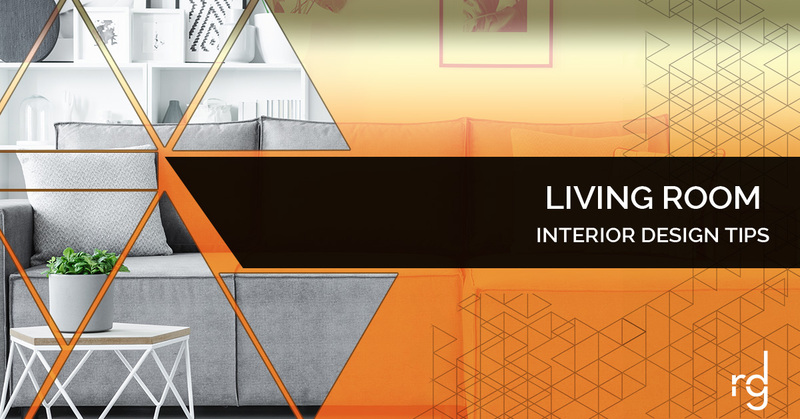 From the interior paint color and carpet choice to the furniture layout, permanent living room features, and living room decor, there is a lot to consider when redoing a living room. It is easy to get carried away when you start a new home improvement project, which is why we recommend reining it in and starting with a focal point. Ask yourself, “What is the purpose of this living room remodel?” and “What does my dream living room look like?” Once you have an image of your ideal living room in mind, pick out the thing that stands out to you most. Is it the faux leather sectional couch? How about the modern electric fireplace or built-in entertainment center? Or is it the living room color scheme, complete with accent walls and wood trim detailing? Whatever it may be, picking out a focal point for your new living room design is the first step in setting your priorities and forming a plan of action. Once you have a focal point in mind for your living room redesign, you can use this as a foundation for the rest of your living space. If you chose a cushy, cream-colored couch, for example, don’t be afraid to play with bolder shades of interior paint and add pops of color throughout the room, such as navy blue and teal throw pillows or a modern area rug with geometric designs. On the other hand, if you prefer bold furniture and funky interior decor, think about balancing it out with a lighter room color and a more neutral carpet style. Setting up a color scheme with a few main colors is a great way to keep your eye focused on a certain look so you don’t stray and find yourself overwhelmed. The world is full of stunning color schemes for living rooms, so don’t hesitate to look online and browse through home design magazines for living room ideas. This will help make your home improvement project seem less daunting, as you have your eye trained to pick out the certain colors, accents, and feelings you want to evoke with your new living room design. Having a color scheme in mind also helps you identify the unique home design style you’re going for. Looking to create a relaxing atmosphere where you can unwind at the end of the day or hang out in your pajamas on the weekend? Consider a few different cool tones, like sky blue, light grey, or cream, all of which are known as calming color tones, and pick out cozy furniture that you and your loved ones will want to lounge around on. Or, if you’re going for an energetic, social environment for your living room remodel, pick out modern furniture, unique wall decor, and think about using brighter accent colors, such as yellow, salmon, or teal, to brighten up the space and give it a nice, vibrant energy. Setting the mood isn’t just about furniture and room colors, though. This is your opportunity to pick and choose fun living room decorations to personalize your space with and create a specific style. If you love the natural look and feeling of the bohemian style, think about incorporating antique wooden features, lots of houseplants, floral pillows, and artistic wall decor, such as a tapestry or a handmade wooden mirror. If you prefer trendy, modern looks, set the mood of sophistication and luxury with boxy furniture in neutral tones like black and grey. You can also play with custom cabinetry and wood paneling to soften the look and make it more comfortable and inviting. Now that you have a better idea of where to start with your living room renovation, remodel, or redesign, it’s time to get to work! At Rinehart Design Group, we understand how overwhelming it can be to piece together your dream living room, which is why we love helping clients bring their dream home to life with a unique living room that is perfect for them. Contact us today to get started on your new living room design, whether that entails a living room expansion or simple redesign with new furniture, wall paint, and more. Interior design and custom cabinetry are what we’re known for, and we are happy to serve clients in Chicago, Atlanta, North Carolina, Florida, and many other states. Call us today for your consultation with our interior design team at Rinehart Design Group!